This course will provide you with an introduction to the methods, equipment and practices for inspection and maintenance of cathodic protection systems. Both galvanic (sacrificial anode) and impressed current systems are discussed. Learn about anode bed inspection and testing for impressed current cathodic protection systems.. This course is intended for civil engineers, structural engineers, mechanical engineers, electrical engineers and other design and construction professionals wanting an introduction to the principles of inspection, testing and maintenance of cathodic protection systems. This course will give professional engineers and others an introduction to the principles and practices that are the basis of corrosion protection system maintenance. 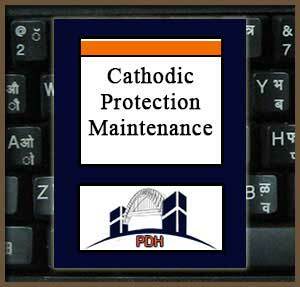 This is an introduction to cathodic protection maintenance techniques for galvanic and impressed current systems. This course will give you an introduction to principles of cathodic protection systems inspection, testing and maintenance.